On March 14, 2015, Charles was interviewed in the Swedish daily Sydsvenska Dagbladet / Sydsvenskan. 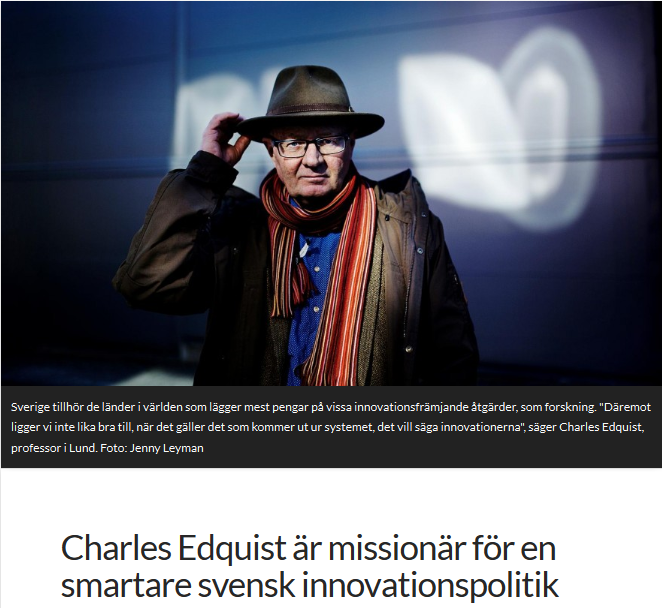 The interview is in Swedish and focuses on innovation policy ─ trying to capture the fact that the Swedish government for the first time regards innovation as a separate policy area. This can be interpreted as an “innovation policy offensive” that is in the making. Time is ripe for a new, and better, innovation policy. You can read the interview here. Click here for the Google-Translated version. Tags: Innovation Policy. Bookmark the permalink.